Here at Hoplon, every studio employee used the have four hours on Mondays to work on personal ideas. That’s how the development of Heavy Metal Machines began, back in mid-2012, when the director Aly Lenzi showed his concept to everyone. After taking its first steps as a weekly project, the game really started taking shape by the end of that year, when we began working full time on it. We released a closed alpha version in late 2013, and it took us another full year to reach its closed beta phase. 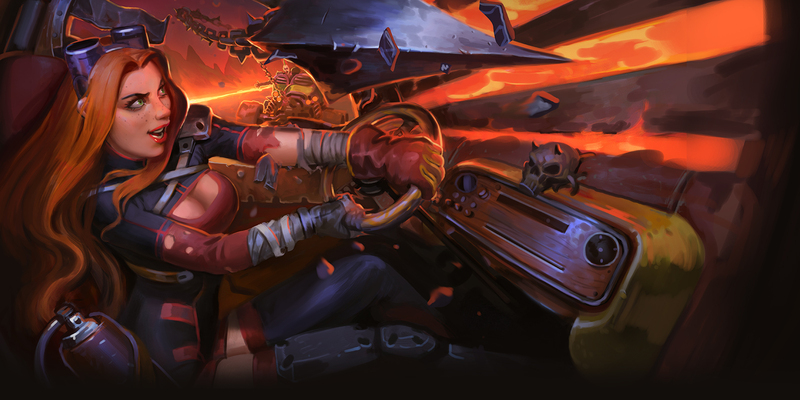 Our first idea was to link the inherently strategic thinking of classic MOBA games with several elements of the Heavy Metal culture and cars. The result was a competitive, multiplayer title featuring a 3-lane map with towers and minions but, instead of reaching into the fantasy universe, its world was a ravaged land contested by Mad Max-esque vehicles: each one containing its own weapons. It’s particularly hard to achieve success by developing and releasing a new MOBA on the market. It’s a niche that already has games with well-established communities such as League of Legends (Riot, 2009) and Dota 2 (Valve, 2013), as it’s a kind of game that many developers abroad are studying and innovating on — something we can accredit to the growth of Esports. Our strategy to stand out in this crowd was to bring frenzy action and speed to the battle arena by putting our vehicles in the spotlight. However, as soon as we made the game available to testers, the issues in our concept started to pop up. Mainly, the incompatibility between the core gameplay and our desire to make Heavy Metal Machines an action-driven game, since MOBAs rely on many static elements: the player’s main objective may be to destroy a tower, for example. There were many times when the player had to stand still to shoot enemies and achieve their goals. That’s not what we were aiming for. In the end, the feedback we received from our studio employees, players and game journalists resonated in consensus: we were promising things we weren’t delivering. It lacked movement, it lacked the spirit of Hot Rods and Heavy Metal. That’s when we decided to reshape it. A very important thing we did during this redeveloping process was to go back to our roots. What were our influences? Was there anything out there that we could take as an example and learn from it? A huge reference to everyone involved was Rock n’ Roll Racing (Blizzard, 1993), the classic 16-bit game. What did it have that captivated us so much? The most obvious answer is that it was able to achieve what we were looking for: a demanding, high-speed game with combat elements. The question now was: how should we adapt what we had in our hands to turn Heavy Metal Machines into the desired result? In order to do so, we had to severely change the game, turning it into something brand new. Our first concern was regarding the static elements on the map. Basically, every stationary object was removed in the new project. Now, instead of destroying towers, both teams have to take a bomb — which spawns at the center of the map — and take it to the enemy base. Going down this path changed our gameplay abruptly as it created different dynamics within the game. 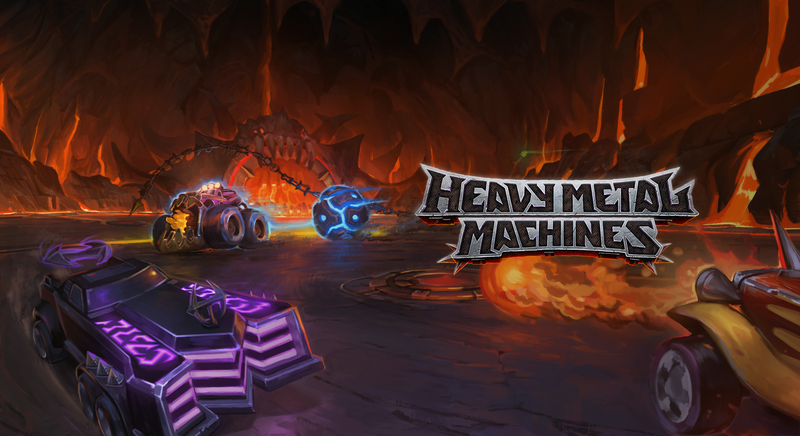 Heavy Metal Machines is now based on chase mechanics: when a player grabs the payload, the team must protect it from enemy attacks while the carrier takes the bomb to its final destination. We also divided the character roster into three groups according to each one’s individual abilities. We believe the creation of two new classes (Interceptor and Transporter) brought another novelty to the game as it enhanced the importance of Supports. A practical example: Dirt Devil, an interceptor, can leap over enemies to avoid damage and slow them down with his harpoon which can be useful to both outwit chasing opponents and easily reach enemies carrying the bomb. His ultimate is capable of killing instantly within a delimited area. We also had to adapt our maps to create a genuine feeling of pursuit and urgency — considering that the classic 3-lane map does not provide this kind of experience. 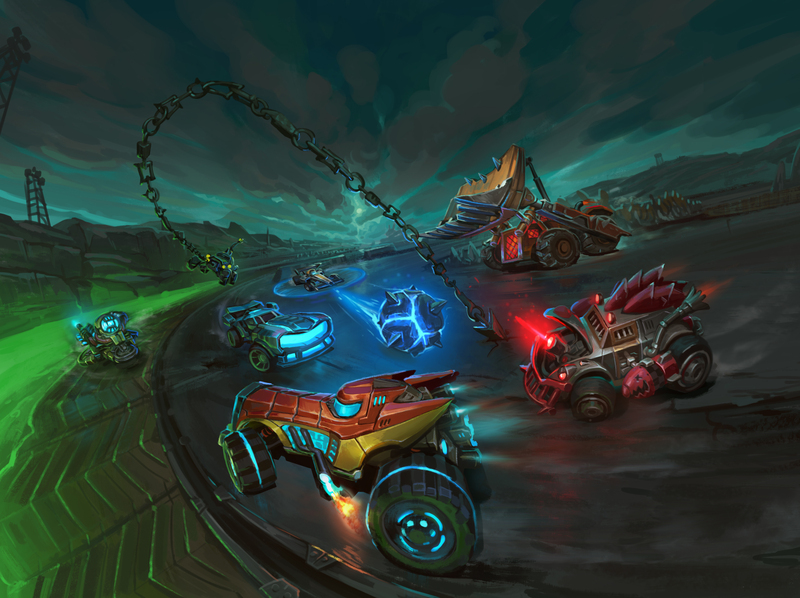 While our arena contains a central plateau where the bomb spawns, both teams have to race on narrow sidetracks with sinuous curves in order to reach the goal, which creates a kind of Rock n’ Roll Racing feeling to the battle while maintaining the idea of a team competition. Ultimately, these modifications brought new needs to the project. In this sense, the most noticeable change lies in the art direction. Due to the increase in the number of actions taking place simultaneously on-screen, we had to change the game’s color palette to make each vehicle and their movements more distinguishable and understandable to users. The dirt tracks gave way to the black of asphalt, which better contrasts with characters’ moves and ultimates. Also, we adapted each vehicles’ contours and contrasts. Sometimes it’s hard to notice what could be done better or polished further in a project, whether you’re working with a small team or in a huge company. 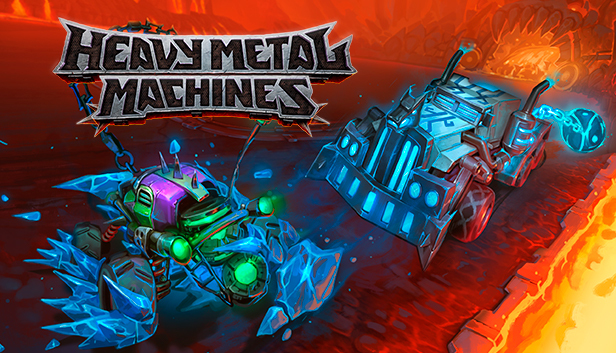 The advice and suggestions we received to improve Heavy Metal Machines made us drastically change our entire game. At first, the idea of revamping an entire concept might have sounded frightening, but in the long run, it has proven valuable: we believe we achieved something unique along the way and we hope players will enjoy it when the game is released. Perhaps, the most precious lesson we’ve learned during this process is that we can’t be afraid of trying again by following a new train of thought.